Our program of work is designed to deliver value to our members using four specific methods: networking, advocacy, marketing, and education. We find it's helpful to remember these methods with the acronym "NAME", with the Chamber's goal to help you make a NAME for your business in Wilson! We believe that by helping individual members in these four ways, that over time, we will help build a stronger, more resilient and vibrant business community. Wilson is a place where a handshake and a promise still mean something. At the Chamber, we host over 50 events every year, and each of them is an opportunity for members to exchange business cards, make a connection, and open the door to new customers. In fact, some of these events are intended exclusively for that purpose. Our Accelerated Networking Luncheons and Chamber B2B meetings are just two examples of convenient ways our members can engage one another. Many of our members are simply too busy running their business to focus on regulatory or governmental issues that might affect them. Fortunately, the Chamber is always working to make sure the interests of our business community are never ignored by key decision makers. By working directly with officials at the national, state, and local level, we communicate the needs of local businesses and help direct action that reduces the barriers to prosperity. Our members come first, which means that of the many referrals we provide every day, nearly all of them go to businesses that have chosen to invest in the Wilson Chamber of Commerce. As the representative voice of the Wilson business community, people trust that what we suggest will be the very best of what our community has to offer. 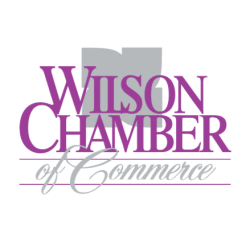 Businesses looking to raise their profile and enhance their credibility know that the Wilson Chamber of Commerce is an effective way to reach their audience. We understand that a successful business is an informed one. That's why we go to great lengths to ensure our members have access to the resources they need to make smart decisions. Whether it's receiving a timely email update from us, attending one of our Public Policy Series events, or simply calling us to help answer a business question, we're here to make sure that our members have the tools they need to respond to a variety of circumstances.